Decked out with a full tempered glass side panel and RGB lighting, the Be Quiet! Dark Base 700 could be a worthy contender for new builds. Featuring USB 3.1 Gen 2 Type-C and room for a some larger radiators, this case is ready for lots of new hardware. Measuring in at 21.4 x 20.4 x 9.48 inches, the Dark Base 700 is an ATX Mid Tower case. Motherboards ranging from Mini-ITX up to E-ATX are compatible, although E-ATX boards must be no larger than 12.08 x 10.82 inches. Weighing in at 29.21lbs, the Dark Base 700 is not a lightweight but is very reasonable for its size. Using a combination of 0.8mm steel, ABS plastic, 1.2mm aluminum, and a 4mm thick tinted tempered glass panel, the Dark Base 700 should provide a solid feel to match its clean appearance. The front IO panel has two USB 3.0 ports, one USB 3.1 Gen 2 Type-C port, and standard microphone and headphone jacks. The backlit power button, status LED, and LED switch for lighting control are roughly centered on the angled front. A slide switch for the four-step fan controller is also located on the front panel next to the USB-C port. The stripes along the front of the case can change between six different colors providing a smooth glow. Moving to the inside of the case, there are two included case fans. The first is installed at the front intake with the second pushing air out the rear of the case. Both are 140mm SilentWings 3 PWM 1600 RPM fans with 6-pole motors and fluid-dynamic bearings carrying a maximum noise rating of just 15.5dB. 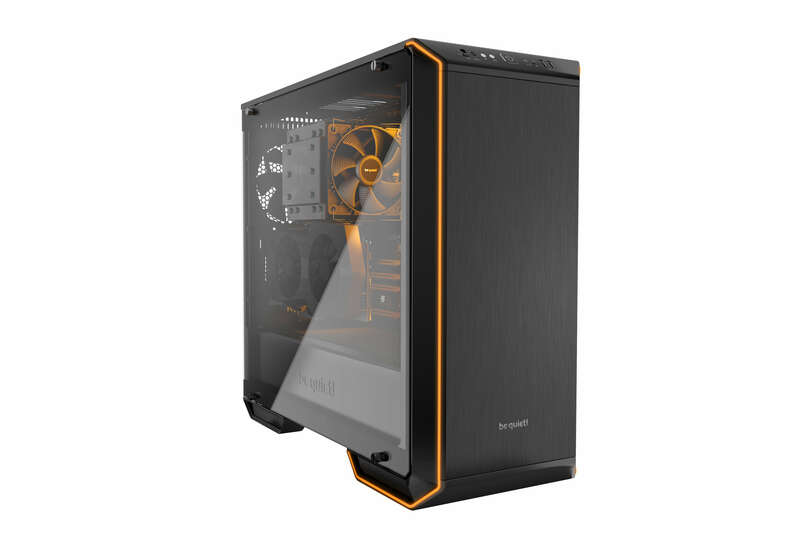 If more fans are needed for your build, the Dark Base 700 supports plenty of cooling options. Two 140mm fans will fit up front, up to three 140mm fans on top, one fan can be used for the power supply shroud, and one more can go on the bottom. Both the top and front support 120, 140, 240, and 360mm radiators. The front also supports a 280mm radiator while the rear allows for a 120mm/140mm option. The top bracket is removable for easy mounting of fans and radiators. For keeping your CPU temperatures under control, coolers up to 7.08 inches tall will fit without pressing against the tempered glass side panel. Graphics cards up to 11.26 inches can fit without removing a hard drive cage. Removing a cage allows an additional 5.67 inches of space for massive GPUs. With the cage installed, there are seven 3.5 inch bays and three 2.5 inch bays. Each 3.5" slot allows for installation of two 2.5" drives if desired. Rubber dampening pads are included to reduce vibration. There are seven PCIe expansion slots in addition to two vertical expansion slots for showing off your graphics card. Obviously this requires a PCIe riser sold separately, but is something to consider when searching for a new case. Pulling out the motherboard tray reveals that it can also be used as a bench, but you probably won't be constantly doing this due to the nine required screws holding it in place. You can also invert the motherboard tray if you decide to try a different airflow pattern. Complete removal of the motherboard tray is convenient for system testing before putting everything into final position within the case. Removing the front panel of the case provides access to the front and bottom air filters. The front is attached with hooks while the bottom simply slides right out the front. It does not appear to be difficult to access the filters, but routine cleaning is unlikely to be convenient since the front panel must be removed every time. The Dark Base 700 will ship with a 3-year warranty and is set to launch November 14. Previously we've reviewed the Silent Base 800, and one of our favorite high-end cases, the Dark Base Pro 900, reason enough to pay attention to what Be Quiet! is doing next.